total number of Jobs. Application mode is Offline. Interested candidates may download application form in prescribed format and send the form along with requisite documents to the E Mail Address dpskhannajobs@gmail.com. Last date to send hard copy of Application forms is 12th December, 2017. All details of Delhi Public School Vadodara TGT/PGT/PRT/PPT Teacher Jobs Recruitment Notification 2017 mentioned below. Educational Qualification: Post Graduate with B.Ed. Pay Scale: Approximately Rs.30,000/- salary per month. Educational Qualification: Graduate with B.Ed. Pay Scale: Approximately Rs.25,000/- salary per month. Pay Scale: Approximately Rs.21,000/- salary per month. Educational Qualification: Post Graduate with B.Ed./N.T.T. Pay Scale: Approximately Rs.12,000/- salary per month. Pay Scale: Salary as per experience only. To get Age Limit details, candidates please refer Official Notification. 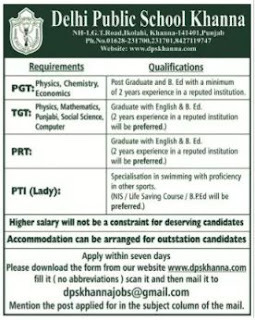 Interested candidates may download Application form in prescribed format through DPS Official Website of www.dpskhanna.com. Fill the form with all your required details of Name of the candidates, Fathers Name, valid mobile number, active E-Mail ID etc. Paste your recent passport size colour photograph on it and send the form through the given email Address dpskhannajobs@gmail.com on or before due date of 12th December, 2017.